The fast-rising Ankush Dahiya (60kg) clinched a gold while the experienced L Devendro Singh (52kg) settled for a silver medal on the final day of the Ulaanbaatar Cup boxing tournament in Mongolia. The 19-year-old Ankush, who is a former Asian youth silver-medallist, defeated Korean Man Choe Chol in a split verdict, while Devendro lost to Indonesia's Aldoms Suguro, again a split decision. India thus signed off with a gold, a silver and three bronze medals from the tournament. K Shyam Kumar (49kg), Mohammed Hussamuddin (56kg) and Priyanka Chaudhary (60kg) -- lost their respective semifinal bouts to settle for bronze medals on Saturday. 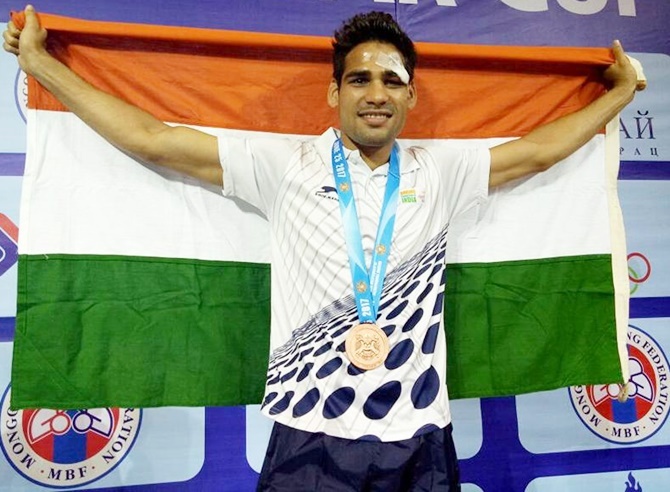 Devendro, a Commonwealth Games silver-medallist besides a former Asian Championships silver-winner, was the first to step inside the ring for India today and was his usual aggressive self against Suguro. The diminutive Manipuri, who is getting back to form after recovering from some niggles, exhausted his rival with a fine display of tempo-boxing, not letting the intensity slip even once. Denied a clear shot due to Suguro's shell guard, Devendro did well to connect fine body blows. However, much to the Indian camp's disappointment, Devendro's overall dominance did not find favour with the judges who ruled 3-2 in Suguro's favour. However, the disappointment soon made way for celebration when Ankush edged past Man Choe Chol. The youngster put his long reach and height advantage to good use and landed some lusty straight blows, which swung the contest in his favour. This is Ankush's maiden international medal at the senior level.